Built by the TC Legend Homes/Powerhouse Designs team. We design and build. With a standard palette of materials & details that have been chosen, tested & refined over many houses, there is no confusion for the crew. The draftsman, engineer, and crew are consistent through all our projects, so everyone has done this system before. Positive Energy – produces enough electricity to also power an electric car. Energy Star, EPA Indoor airPLUS, and 5-Star Built Green Certified. Honorable Mention in the Affordable Category of the 2018 US Department of Energy Housing Innovation Awards. The home is oriented for both passive & active solar performance by facing south, as a rectangle with the long side (26’) running from east to west. The home is outfitted with an 8.1kw photovoltaic system. Energy envelope includes structural insulated panels (SIPs). The 6.5" Neopor R29 SIPs panel walls are locally made in Washington. Designed & engineered to reduce cold bridging by minimizing structural lumber & maximizing use of foam splines to connect panels. Shell is air sealed with triple beads of mastic at all joints and panels additionally taped at all joints. RIM joist insulated with R30 spray-foam at floor systems. Perfect rectangle box adds simplicity to construction & reduces corners & thus cost & air leakage. 4" Extruded Polystyrene (EPS), a low VOC foam (R20), is used under-slab. The concrete slab-on-grade is exposed and is effectively a free finished-floor and a functioning thermal mass. The heat recovery ventilator (HRV) is a Zehnder Comfo-air 200 which can scavenge 95% of the heat from the outgoing dirty air. Running through a class 4 filter (merv7/8) at between 29 and 118 cubic feet/ minute (cfm), the unit ventilates the whole house, extracting moist air from bathrooms/utility spaces, bringing fresh air into living spaces. Energy Star appliances including a Geospring 50-gallon heat pump-powered hot water heater. Stormwater from the roofs is infiltrated on-site using splash blocks below the gutter downspouts. Home Energy Rating System (HERS) Index is negative 25! (A typical new home has a rating of + 62). This is a Built Green Emerald Star home in West Seattle. It was the first Emerald Star home for TC Legend and the second of its kind built in Seattle! It is also a Department of Energy 2018 Housing Innovation Award Winner and Built Green’s “Green Hammer” Project of the Year! This floorplan is flexible into the future, with two extra bedrooms already in the program, fitted with egress windows & minimum floor area to meet code; One will partition behind the utility, the 2nd can partition from the recreation room upstairs. So this 3 bedroom main house can grow to 5 bedrooms in a day! The energy-shell is a simple rectangle, conforming to and ideal 1:1.6 established ratio for temperate environments. SIPs shell construction is post & beam type of load-bearing construction that means internal walls can be moved easily during the life of the building as they carry no load. The post & beam structure is visible as both architecture and a celebration of the woodcraft of the Pacific Northwest. Low- or no-VOC products sourced throughout. No PVC. This Built Green 5-Star zero-energy home defines the Seattle eco-lifestyle. It features an open floor plan, heated hardwood floors, 9-foot ceilings, and exposed beams. On the roof, a 9.5kW net-metered solar array provides all the home's power needs, and an electric car charging station is built into the garage. Triple-pane windows and SIPs construction offer plenty of insulation, and a whole-house filtration system keeps the air pure. Designer touches include Hinkley lighting, custom cabinetry, Carrara marble countertops, stainless steel appliances, an induction cooktop, and a 9-foot kitchen island. 1,915 square feet, single-family, 2 stories, 3 bedrooms + work loft, 2 bathrooms, concrete slab foundation, radiant heat floors, Hardie plank siding. Net-zero on a budget: A 1,055-square-foot home in Bellingham, WA that, features high-efficiency appliances, a balcony, a greenhouse, a patio, a loft, tongue-and-groove pine ceilings, and solar photovoltaic panels—all for $151,908 or $144 per square foot (not counting the land). A 3.2-kW PV system is all it takes to power the home, thanks to a highly insulated building envelope and high-performance equipment. This custom net-zero-energy home, built for a Bellingham couple nearing retirement, won the grand prize in the Affordable category at the U.S. Department of Energy’s Housing Innovation Awards. The house is small but spacious feeling. It utilizes passive solar heat gain during the cold months, and is net-zero. (The photovoltaic energy annually produced equals all the energy annually consumed, including gas.) Best of all, it is very affordable. This home, a collaborative design effort between TC Legend Homes and the homeowners, was intended to demonstrate an alternative to ultra-expensive, extravagant “green” homes commonly seen. A net-zero home which is truly affordable for the average person perhaps has the greatest potential for conserving our planet’s resources. The footprint is only 630 square feet, but the added loft brings that up to about 1,000 square feet of living space. The foundation is constructed from insulated concrete forms (ICFs) with a concrete slab-on-grade floor. A waterproof concrete with premixed dye was used. Four inches of rigid foam under the slab provides insulation from the ground. This floor serves as a thermal mass during sunny winter days, absorbing and storing the sun’s heat as it shines through the south-facing windows and doors. The walls and roof are assembled from structurally insulated panels (SIPs). These factory-cut custom panels feature continuous foam insulation sandwiched between two OSB boards. This eliminates the thermal bridging which causes cold spots where studs are located when conventional framing practices are employed. The walls were made from 6" thick SIPs, and the roof was made from 10" thick SIPs. The house is oriented with the front facing south, both to maximize passive solar gain and to present a south-angled roof on which to mount the solar panels. All of the windows are triple-paned low-E glass. The porch roof angle allows the sun to enter the house in the winter but blocks the higher-angled sun during the summer months. There is also a green house off of the kitchen portion of the porch. The primary heat source during non-sunny periods is an electric "mini-split" heat pump. These remarkably efficient units will keep a home of this size comfortably warm during the winter months for a fraction of the typical heating costs of the average house. The monthly total electric bills for this electrically heated house range from $9 to $30. The head unit of the heat pump is positioned so that warm air is directed toward the concrete floor, storing the heat and warming the floor. Fresh air exchange can be a challenge in tightly sealed homes such as this. Many modern homes solve this with expensive and power-consumptive heat exchange ventilation systems. As an alternative, this home employs a very simple, but effective, solution. Incoming air passes through "earth tubes," which pre-warm the air in the winter and pre-cool it in the summer. The appliances are smaller in size and very efficient. The slightly smaller appliances allow room for more counter space. The counters are stained concrete, molded on site, a considerable cost savings. The hot water system is a tankless, on demand unit. Perhaps the most unique feature of this home is the feeling the internal space instills. There are only two internal doors. They are on the bathroom and a small downstairs bedroom. The rest is one open living space, but wherever one stands it feels like a separate room, and it always feels spacious. The layout was tailored to meet the needs of two people without children, but with only minor changes it could comfortably be converted to two bedrooms and two bathrooms. 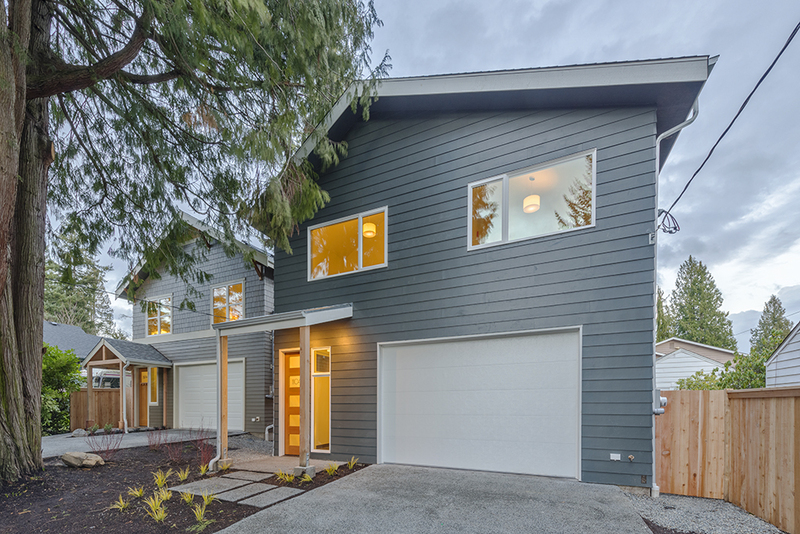 The Bellingham home achieves this performance with a simple plan designed by Clifton to maximize efficiency and minimize cost, with an open two-story layout including a small 630-ft2 footprint and a 400-ft2 loft. The home was placed on the lot to maximize passive solar heat gain and avoid shading the PV system, while retaining existing trees. Attention to detail helps Clifton achieve a very airtight envelope that shows air leakage of only 0.67 air changes per hour at 50 Pascals pressure difference (ACH 50) when tested with a blower door. . . . “Normally the insulation contractors spend about 2 hours air sealing. We spend 20 hours or more on a house, depending on the size of the house. It’s a line item in the budget. We may spend $2,000 on air sealing because we caulk everything,” said Clifton. The home’s standing seam metal roof simplified installation of the 3.2-kW grid-tied PV system. The homeowners Kristina and Mike Heintz were so interested in the installation of the solar panels that Kristina took on the task of locating the best solar value possible and ordering the panels. She has since joined TC Legend’s staff to handle solar panel purchases for other clients. . . .Clifton noted that while the 3.2-kW system meets all the home’s power needs, there is room on the roof to add enough PV to power an electric car as well. This net-zero-energy house remodel in Green Lake is designed to be affordable, energy-efficient, and surrounded by lush gardens. It is a great example of an affordable deep-green remodel. Collaboration between owner, architect, and builder has created a beautiful synthesis of resource efficiency, connection to nature, and renewable energy — mixed together with a funky modern/industrial aesthetic.